If you're looking for a great (and cheap!) hotel in Amsterdam, CheapTickets is the best place to find them. We offer deals on the best 700 hotels throughout Amsterdam. No matter what you're looking for, we have options for you. Grab great rates on the 290 affordable 3-star hotels that are easy on the wallet without sacrificing comfort. Looking for more luxury? Try one of the 193, 4-star hotel accommodations in Amsterdam. No matter your budget needs, we've pulled out all the stops to make sure you have plenty of vacation options. Maybe you prefer to search for your hotel deals based on what each hotel offers? For example, let's say you just want to find a hotel or resort that has a pool to cool off in after a long day exploring Amsterdam. Scroll down to choose from the 72 hotels in Amsterdam that has a pool for guests. Or search for deals on Amsterdam hotels offering free wifi or breakfast, non-smoking rooms, and more! CheapTickets is here to be your personal travel agent for your next trip to Amsterdam. Get booking today! What hotels in Amsterdam offer free wifi access? Are there deals on Amsterdam hotels offering free breakfast? Yes! The only thing better than finding a great deal on a cheap hotel in Amsterdam is finding one that offers free breakfast. Grab some eggs, a waffle, or some healthy oatmeal before a day full of exploring Amsterdam and all that it has to offer. Below are just some of the many hotels that offer free breakfast in Amsterdam. 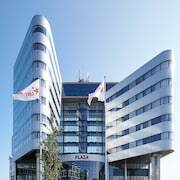 Park Plaza Victoria Amsterdam is a 4.00 star rated hotel property in Amsterdam that offers free breakfast. 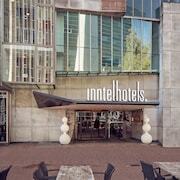 Inntel Hotels Amsterdam Centre is a 4.00 star rated hotel property in Amsterdam that offers free breakfast. The Amsterdam Canal Hotel is a 3.50 star rated hotel property in Amsterdam that offers free breakfast. Max Brown Hotel Canal District is a 3.00 star rated hotel property in Amsterdam that offers free breakfast. What about deals on pet-friendly hotels in Amsterdam? Amsterdam is a great place to get outside and explore with your pets in tow so don't leave your furry friends behind. Below you'll find great deals on hotels in Amsterdam that allow pets. Don't forget to bring plenty of treats! Ambassade Hotel is a popular, pet-friendly, 4.00 star hotel in Amsterdam. 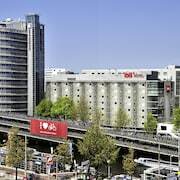 Hotel ibis Schiphol Amsterdam Airport is a popular, pet-friendly, 3.00 star hotel in Amsterdam. Banks Mansion is a popular, pet-friendly, 4.00 star hotel in Amsterdam. The Toren is a popular, pet-friendly, 4.00 star hotel in Amsterdam. Any good rates on Amsterdam hotels with restaurants? Absolutely. Don't want to deal with planning our all your meals on your trip to Amsterdam? We don't blame you. Keep the hangry away by staying in one of the 165 hotels that have restaurants. With a room at one of these spots, all it takes to get a good meal is hopping in the elevator. Check out some of the most popular hotels in Amsterdam that have restaurants below. 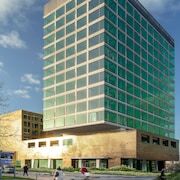 Book Mercure Hotel Amsterdam Sloterdijk StationMercure Hotel Amsterdam Sloterdijk Station is a 4.00 star hotel and has one or more restaurant options. 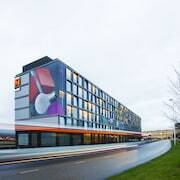 Book Hyatt Place Amsterdam AirportHyatt Place Amsterdam Airport is a 4.00 star hotel and has one or more restaurant options. Book Hotel Notting HillHotel Notting Hill is a 4.00 star hotel and has one or more restaurant options. Book Hilton Amsterdam Airport SchipholHilton Amsterdam Airport Schiphol is a 4.00 star hotel and has one or more restaurant options. What are the cheapest hotels in Amsterdam with pools? What's better after a long day exploring Amsterdam then a relaxing dip in a pool? Finding the Amsterdam hotel you need for a bargain! Cool off and unwind at one of our 72 Amsterdam hotels with a pool. Browse some of the top deals on these hotels and resorts with pools in Amsterdam below, but be warned: You may not want to check out! Royal Amsterdam Hotel has a pool and a 4.00 star rating. 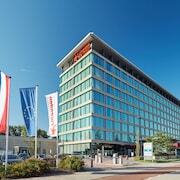 Corendon City Hotel Amsterdam has a pool and a 4.00 star rating. West Side Inn Amsterdam has a pool and a 3.00 star rating. MEININGER Hotel Amsterdam City West has a pool and a 2.00 star rating. What hotels in Amsterdam offer parking for guests? Once you've made your way to Amsterdam, the last thing you want to deal with is finding parking close to your hotel. Avoid the hassle of parking around the block and carrying your luggage all the way to the lobby by booking one of our hotels with parking. 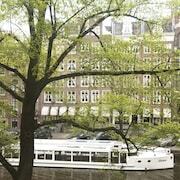 Check out deals on some of the 277 hotels in Amsterdam that offer parking for guests. Mercure Hotel Amsterdam City This hotel has a 4.00-star rating. Leonardo Hotel Amsterdam City Center This hotel has a 3.00-star rating. Swissôtel Amsterdam This hotel has a 4.00-star rating. Max Brown Hotel Canal District This hotel has a 3.00-star rating. Do Amsterdam hotels offer 24-hour concierge services? When you're on vacation, things don't always go according to plan. Travel with peace of mind when you book one of our 121 hotels in Amsterdam with 24-hour concierge service. That way you know help is always phone call or elevator ride away. Try Hotel Estheréa. It's a 4.00 star rated hotel in Amsterdam that offers concierge services 24 hours a day. Try Hotel Notting Hill. It's a 4.00 star rated hotel in Amsterdam that offers concierge services 24 hours a day. Try Hilton Amsterdam Airport Schiphol. It's a 4.00 star rated hotel in Amsterdam that offers concierge services 24 hours a day. Try Swissôtel Amsterdam. It's a 4.00 star rated hotel in Amsterdam that offers concierge services 24 hours a day. What about low rates on non-smoking hotels in Amsterdam? Hotel Iron Horse This hotel has a 3.00-star rating. 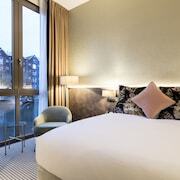 Van der Valk Hotel Schiphol A4-Amsterdam Airport This hotel has a 4.00-star rating. Room Mate Aitana This hotel has a 4.00-star rating. Hotel Notting Hill This hotel has a 4.00-star rating. What are the cheapest Amsterdam 3-star hotel deals? Our 3-star hotels bring you quality accommodations at a lower price point for the perfect, budget-friendly vacation in Amsterdam. With 290 3-star hotels throughout Amsterdam to choose from, you still have options. Browse our selection below. WestCord City Centre Hotel Amsterdam. This Amsterdam hotel is about a 5-minute walk from Centraal Station. Dam Square, Oude Kerk, and the Royal Palace are all within 0.4 km (0.2 mi). The Anne Frank House is 0.7 km (0.4 mi) away. Eden Hotel Amsterdam. Across the street from the Amstel River and 150 metres from the famous Floating Flower Market, this Amsterdam hotel is 50 metres from the sidewalk cafés surrounding Rembrandt Square. Royal Palace and Dam Square are 1.5 km away. Hotel Cornelisz. Located in Museum Quarter, this hotel is steps from P.C. Hooftstraat and Rijksmuseum. Van Gogh Museum and Stedelijk Museum are also within 10 minutes. Max Brown Hotel Canal District. Located in Old Town, this hotel is within a 15-minute walk of Noorderkerk, Anne Frank House, and New Church. Dam Square and Royal Palace are also within 15 minutes. What are the best deals on 4-Star Hotels in Amsterdam? Amsterdam is full of hotels and it can be hard to narrow down where you really want to stay. Luckily, we've done that hard work for you be narrowing you from 700 hotels throughout Amsterdam, to the 193 4-star hotels in Amsterdam. Our 4-star hotels in Amsterdam are exactly what you need for your next family trip, romantic weekend, or solo getaway. Check out our most popular deals below. Inntel Hotels Amsterdam Centre: Bordered by a warren of narrow streets lined with pubs, cafés, and restaurants, this hotel faces a small square, and is 400 metres from the central train station. Dam Square, Royal Palace, and Nieuwe Kerk are all within 500 metres of the hotel. Room Mate Aitana: Located in Jordaan, this hotel is within 1 mi (2 km) of Noorderkerk, Anne Frank House, and The Old Church. Dam Square and New Church are also within 1 mi (2 km). Park Hotel Amsterdam: This hotel is in several traditionally-Dutch, canalside properties and is set in the centre of Amsterdam, 300 metres from Van Gogh Museum and the nightlife of the Leidseplein. American Hotel Amsterdam: The Amsterdam American Hotel - Hampshire Eden was built in 1900 and is officially listed as a monument. This hotel combines an elegant Art-Deco heritage with modern facilities and Roaring-Twenties ambience. What are the best activities to do in Amsterdam? Hard Rock Cafe Dining with Priority Seating: Starting at just $28 per person. Amsterdam Bike Tour of Historical Center: Starting at just $26 per person. I amsterdam City Card: Starting at just $70 per person. Evening Canal Cruise: Starting at just $23 per person. Larger rooms, Clean and good diner. Falsely advertised as free WiFi but they charged me Euro 10 a day for WiFi. The property is excellent and I have a wonderful view of the plane (cool). We stayed at Sheraton Amsterdam Airport Hotel for three nights. The location was really nice. We could easily access to the downtown. And it was really quiet in the room even though the hotel was right in front of the airport. We were surprised that we didn't hear any noise. Everything was so clean and we loved that we could have self-serviced coffee and tea! Also, being able to use the gym was good especially for the holiday season. Excellent location!!! Facility is clean and staffs are very nice!! Gideon at the front desk specially :).